Andrew’s thoughts: Love this for the Double Stuffs, who essentially traded Derek Fisher for DJ LeMahieu straight up, then gave the Rockies’ 2B a $5 raise. LeMahieu made some crazy offensive strides last season — and not just in Coors (he had a .326 road wOBA) — that put him in the conversation as a top-8 or so 2B. Mainly, his walks and strikeouts both moved dramatically in positive directions. At $15, he’s an incredible value. 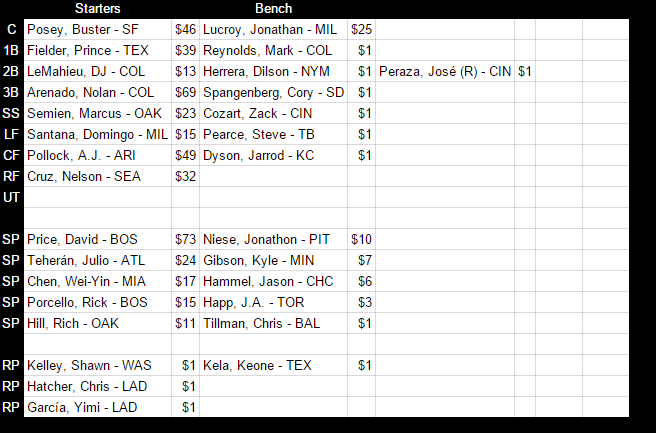 Based on Steamer’s projection and my early auction calculator, he’s projected to be worth $31. So that’s a big swing. Still, he had an absurd .388 BABIP last year, so I think some regression is in his 2017. But even if he’s the guy he was in 2015, he’s worth $15 (or $20, however you want to look at it). Playing in Colorado pushes his floor up too. For Hydra, they essentially make $20 worth of budget room, add an interesting prospect, and still have Steve Pearce and Jose Peraza (who is way more interesting in 5×5’s, but whatever) to man second. Their entire off-season has revolved to this point around keeping both Corey Kluber and David Price, so this trade works well to that end. Fisher, meanwhile, is a good if unexciting get. Baseball Prospectus recently ranked him eighth just in the Astros’ system, but that’s largely because his defense isn’t very good. He may be a LF, which isn’t so unfortunate given how shallow that spot currently is. In that same ranking, they pegged him as a good dynasty piece, though one who’s probably more “ceiling” than “floor.” If your main objective is to purge salaries though, then getting a guy back who does have significant upside is a good gamble. Jordan’s thoughts: I think Double Stuffs really got a great deal here. I could echo everything Bailey said, but I won’t. They paid a relatively low price for a very useful asset. They created value at the cost of a prospect and a couple of auction dollars. For Team Hydra, their auction dollars are as valuable as anyone’s in the league. So from their perspective you have to love the deal as well. I would not want to have to sell players who have value for 70 cents on the dollar. But, being in that position, with the rest of the league knowing it, and still getting 70 cents on the dollar is really actually quite good. There’s some chance that the prospect is good and a good value for Hydra. But, they don’t need him to ever reach the Majors for this deal to work. They got something for potentially nothing (if they were going to have to cut players who have value). Quite a score for them.